A series of videos are being run on YouTube that appears to provide very reasonable descriptions of how a motorcycle steers at slow speeds - until you get down to the reality of it. Those of you who have read my stuff know that I maintain that the ONLY way to steer a motorcycle at normal riding speeds, indeed at any speed over about 6 MPH, is via counter-steering. I also maintain that the ONLY way to steer a motorcycle going at very slow speeds is via direct steering. Yet this video makes a very compelling case that counter-steering can be accomplished at very slow speeds. It is wrong. The fundamental mistake in his presentation is his definition of counter-steering. He maintains that it is the process whereby when you turn the handlebars in one direction the motorcycle will lean in the other direction and therefore move in that other direction. It sounds pretty good, but it is actually a definition crafted to support his contention rather than fact. The fact is that counter-steering, or direct steering, results in a change of direction, not lean. A change of direction results in a lean, a lean does not result in a change of direction. The result of that video being watched by members of my board is that several of them became convinced that counter-steering works at any speed and they used that video to 'prove it'. 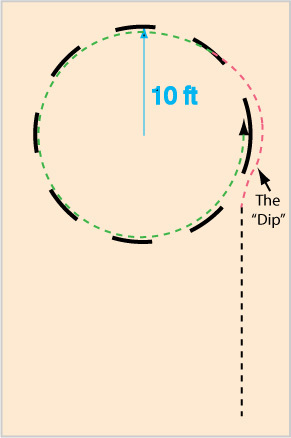 In fact what that video demonstrates is what some of us call 'the dip maneuver' which is no more, nor less, than direct steering in one direction followed by direct steering in the opposite direction (at very slow speeds) or by counter-steering in one direction followed by counter-steering in the opposite direction at higher speeds. The video is an example of what has been described on my board as doing a 'dip' at slow speed. It is SIMILAR to counter-steering in terms of results, but it is actually direct steering in one direction followed immediately by direct steering in the opposite direction. It is NOT necessary to do a 'dip' before actually steering at slow speeds while at higher speeds there is nothing optional about steering - you MUST use counter-steering and CANNOT use direct steer. 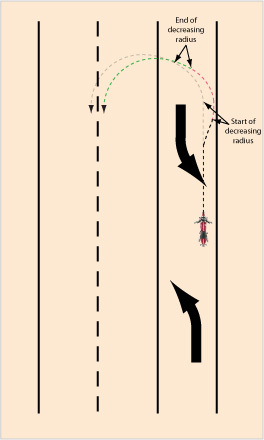 What a dip does is cause a lean of the bike without you having to lean your body in support of the turn. You can simply turn the handlebars (direct steer) at slow speed to accomplish the same thing as you use your body to maintain bike balance. This is what virtually everybody actually does. A dip at the start of a slow speed turn provides one valuable advantage over simply direct steering: it allows you to start your turn on a tighter radius. That is, it gets you leaned over sooner in the turn. In essence, it allows you to begin the turn from farther outside of the radius as the dip forces you to track wide to begin with. There is no argument that centrifugal force exists at very slow speeds - but it is trivial as compared to at normal riding speeds. For that reason while you are making very slow speed turns you CANNOT simply maintain the counter-steer pressure and expect to move in any direction other than that pointed to by the front wheel. The announcer on that video makes it clear that 'doing it wrong' can make the bike fall over. What he means is that if you maintain a 'counter-steer pressure' at very slow speeds, unless you immediately DIRECT STEER in the direction you want to go you will fall down as gravity will have its way with you. This video demonstrates the dip, not counter-steering, despite what the announcer calls it. Maybe a picture or two will make 'the dip' more obvious. 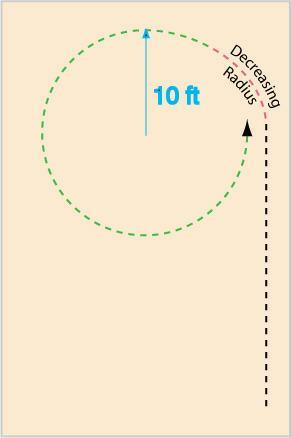 You wish to demonstrate the bike's ability (and yours) so you layout the target as shown above with some chalk. It turns out, however, that you find it impossible to keep your wheels inside the chalk marks all the way around the target. Why is that? Because your bike doesn't change from a straight line into a full tight turn instantly. For some period of time, the transition period, you are carving a decreasing radius turn. The part of the turn shown in red is that transition period. What that means is that it is impossible to start the 10-foot radius turn anywhere on or inside the circumference of the circle. In other words, you must start that turn outside the circle some distance. 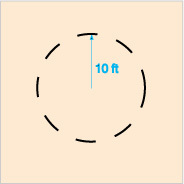 An alternative is to do the 'dip' from any point approaching the circumference of the circle. A member of the board then said he was confused and asked if the dip was actually a steer/steer maneuver then it wasn't really counter-steering at all, was it? My response: Nope. If it were counter-steering, then you would make one steering input to accomplish the turn, not two. What is the practical value of this discussion? Well, have you ever tried to do a U-turn? 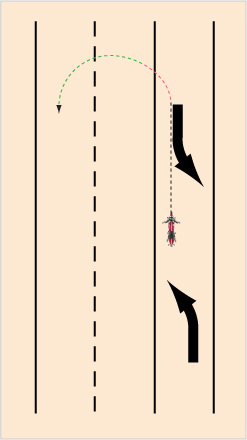 Since lanes are usually 10 or 11 feet wide, that means using this bike you would normally make the U-turn using two opposing lanes as shown in the left diagram. However, using intelligent lane positioning and the 'Dip maneuver', you could make that U-turn using just one opposing lane as shown in the diagram on the right.